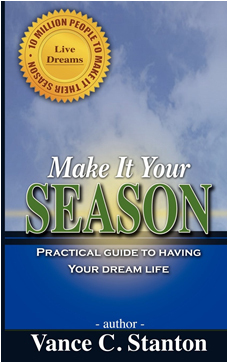 Make It Your Season, is the debut book by life coach and motivational speaker Vance C. Stanton. This easy to read, but powerful book will enlighten readers on a tried and tested formula for achieving success in every area of life. With the odds against him, and being raised in impoverish surroundings, Vance broke through the barriers of hopelessness and discouragement to becoming a business mogul. Now living his dream life, Vance is sharing his unique formula for success to revolutionize the lives of millions. In this inspiring book, you will see that no matter the challenge or how difficult the circumstance, anyone who has the desire to change can achieve their dream life. Destroy debt, defeat weight gain, dismiss disorganization, and stop waiting for your best life. Take charge of your life and your circumstances to reach your destiny by making it your season!